A perfectly moist, subtly sweet, lemon poppy seed loaf made with chickpea (garbanzo bean) flour! 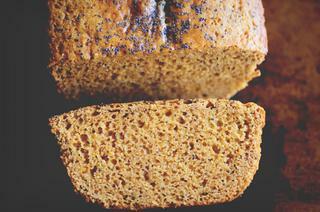 This gluten-free bread makes a great healthy breakfast, snack or dessert! A subtly sweet, tender, moist Gluten-Free Lemon Poppy Seed Bread made with protein and fiber-rich chickpea flour . . . This bread is SO GOOD! I must say that I was incredibly happy with how this creation turned out. I adore chickpea flour (a.k.a garbanzo bean flour), and having used it for many savory applications, I was anxious to create a sweet baked good with it. And boy was I ever so happy . . . This gluten-free loaf has all of the fiber and protein-rich properties of chickpea flour in one lusciously tender and moist, perfectly (not too) sweet lemon poppy seed bread that also slices and holds together like a dream, stores well (if it lasts that long! ), and is oh so DELICIOUS! It truly makes for one healthy and beautiful bread. I cannot for you to give it go & tell me what you think! Preheat oven to 350°F. Grease or line a loaf pan with parchment paper; set aside.In a large mixing bowl mix dry ingredients flour through salt. Stir to combine.In another bowl combine wet ingredients eggs through vanilla. Whisk until smooth.Pour wet ingredients into dry ingredients. Mix until well combined. Fold in 1 tsp poppy seeds.Pour batter into prepared loaf pan. Sprinkle with remaining 1 tsp poppy seeds.Bake for 45 minutes or until loaf is golden and toothpick inserted in center comes out clean.Let cool before slicing and serving.Enjoy!